BATTLE CREEK, Mich., Oct. 25, 2018 /PRNewswire/ -- Kellogg Company announced today that it is expanding its Global Sustainability Commitments to include a goal of working towards 100 percent reusable, recyclable or compostable packaging by the end of 2025. 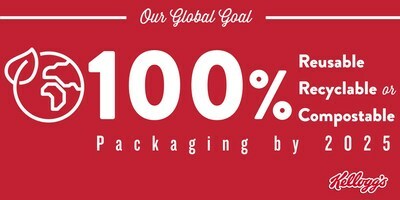 This aspiration builds on Kellogg's current sustainable packaging commitment, as part of its Sustainability 2020 goals, to continue to ensure 100 percent of all timber-based packaging is either recycled or certified as sustainably sourced. These actions all contribute toward Kellogg's support of U.N. SDG #12- Sustainable Consumption and Production, including 12.5, to substantially reduce waste generation through prevention, reduction, recycling and reuse. It also contributes to Kellogg's commitment against SDG #12.3, to halve per capita global food waste at the retail and consumer level, and to reduce food losses along the production and supply chains including post-harvest losses by 2030.